The musical personality of Bernat Vivancos (Barcelona, ​​1973) is marked by the impressions received during his school years at the Monastery of Montserrat. Son of a deeply musical family, having completed studies in piano and composition with Maria Canals and David Padrós in Barcelona, he moved to Paris for five years to study composition at the Conservatoire National Supérieur de Musique et de Danse de Paris -center for avant-garde European music-, with professors Guy Reibel, Frédéric Durieux, Marc-Andre and Alain Dalvabie Louvier, where he graduated on Composition, Orchestration and Analysis. The year of 2000 became a turning point in his career, he discovered the music of Norwegian composer Lasse Thoresen, and moved to Oslo to broaden his studies there, in fact, this will mark his musical directions and future work. Thereafter Vivancos style incorporates elements that make his work a unique proposal: a music sound rich of color and textural, modal music converge on Western tradition and the search for a spirituality based on a Spectral harmonic inspiration. These two fundamental aspects represent the strong influence of the nature of Vivancos ‘s work: nature as root and soil, symbol of tradition, but also as a presence that manifests itself consistently in the physical properties of sound. Since 2003 he is professor of Composition and Orchestration in the Catalonia College of Music (ESMUC) a post he combines with his research activities in the field composition, and the request to participate as member of the jury in international orchestration and composition competitions. From 2007 to 2014 he served as the music director of the Choir of Montserrat. During 2014-2015 he was Composer on Residence, shared with Arvo Pärt, in Palau de la Música Catalana (Barcelona). He has published several CDs, among which stand out “Blanc” (2011) (doubly rewarded by critics as the best album of 2011), and “Requiem” (2015), both recorded by the famous Latvian Radio Choir conducted by Sigvard Klava (Neu Records). Vivancos’ music, full of limpid sounds and ecstatic harmonies, climbing architectures and resonances of nordic luminosity, aims to unite beauty, sensuality and spirituality. 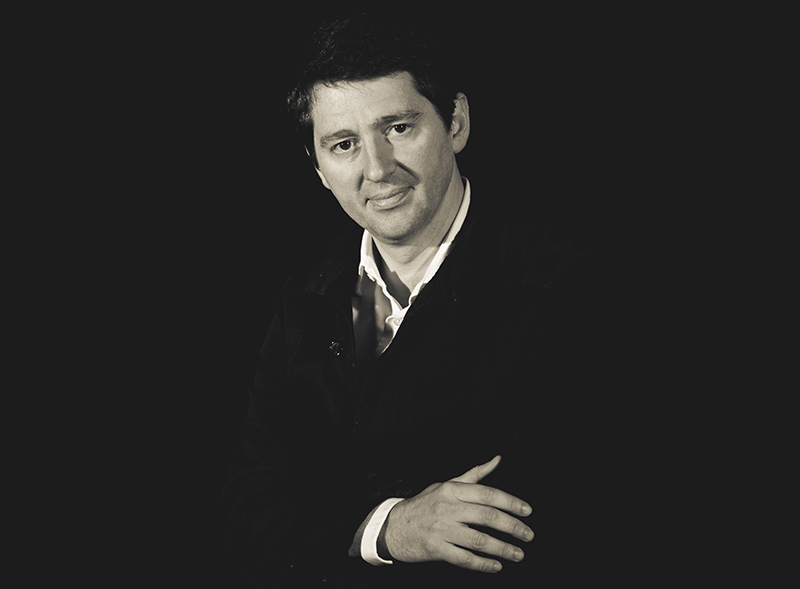 Vivancos has a wide range of vocal and instrumental music, with particular attention to orchestral production, and receives commissions from numerous international ensembles. It is certainly unusual, or unexpected, that a musician specialised in the historical, pre-1800 repertoire should write about the creative work of a young composer of our own time. I discovered the music of Bernat Vivancos, firstly, thanks to the magnificent double CD “Blanc” with choral works performed by the Latvian Radio Choir, (given to me last year by my friend Lluís Vilamajó); and a few months ago, on 6th March to be exact, I was lucky enough to meet Vivancos personally and to hear some of his remarkable pieces on the occasion of the memorable concert in the Basilica of Santa Maria del Pi in Barcelona; a concert in homage to my friend, the much admired composer Arvo Pärt (who this year celebrated his eightieth birthday). Fortunately, thanks to the complex, historical process of discoveries and creation, of recovery and, finally, also, of recognition of the atemporal value of every work of art, we see that, today, a better knowledge of our thousand-year- old musical heritage can act as an element of inspiration and revitalisation in the creative practice of contemporary music; new composers of our own day are being widely incorporated into this veritable, new musical Renaissance that we are experiencing in the twenty-first century. The innovative richness of the works by Bernat Vivancos are, I believe, the clearest and most striking proof of the vitality of this new musical Renaissance. His extraordinary talent and his profound spirituality are placed at the service of a process that is the invention of a new language which, in spite of its complexity and modernity, is capable of transmitting to us pure beauty and emotion. Perhaps this is the great mystery of creativity in any true work of art, in one capable of achieving a perfect balance between technique and emotion, between beauty and spirituality, creating a web of new sounds which, becoming our own, will never cease to move us. I think of these eight works as a long meditation on musical and literary themes that are part of the life of the monastery, from the perspective of a musician who has lived, worked and, probably, composed there. From what I have heard, I would say paraphrase for voice, organ, surprise, bell and Vivancos. It’s not a joke; if we stop to listen, we can feel that the author is hidden – or makes himself known, perhaps – in the style. As happens in literature. And furthermore, as a gift of his style, all the pieces offer us musical allusions, requiring us to take personal, imaginary journeys as we listen. The delicious traditional German song Es ist ein Ros entsprungen (A rose has sprung up; also known in English as “Lo, How a Rose E’er Blooming” or “A Spotless Rose”) which refers to the birth of Jesus, becomes, I think, a musical discovery. I don’t know if it’s nonsense to say this, but listening to the piece for the third or fourth time, a physical image came to mind: Bernat Vivancos’s music works in the same way as “Las Meninas” by Picasso. Vivancos begins as he should, respecting the model, and then he converts it, via Michael Praetorius I suppose, leading it into his own sound world, enlarging it and carrying it away from the original model which, however, is never forgotten, as we see in the mechanics and drive of the theme and variations. The final result is a musical miracle. And I don’t say this because it is my favourite pieces, which isn’t the case. Looking at these works from the perspective of personal taste, one would have to talk about eight musical miracles. I haven’t attempted to analyse the music because I wouldn’t know how to. I have tried to explain, as simply as I can, the hold this music has on me. Luckily, I still have the music to listen to and observe. I cannot express everything I feel; but I know, precisely, that what touches the ineffable is what has enriched me as a person, and will enrich whoever else listens to this music. I’m sure this is why we say that a work of art grows from a debt of love. Bernat Vivancos’ music is like a city of angels: blissful sounds populated by saintly spirits hiding between the notes as birds in a tree. In saying so I do not simply refer to his string orchestra piece of the same name; rather, I think this title may well serve as a motto for all of his vocal music. Bernat Vivancos’ musical personality is permeated with the impressions that he received as a choir boy and music student at Montserrat – the eldest existing music conservatory in the Western world, and a sacred place for the Catalonian Catholics. The church with its black Madonna, the legends about the foundation of the church and the monastery, the location of the church in a mountain crevice among phallic looking mountain peaks – all this suggests mystery, adoration, devotion, and the freeing of man’s spirit from daily struggle and worry through its ascension into a sphere of heavenly dreams and visions. This atmosphere is embedded in Vivancos’ music, above all in his choral setting of sacred text. For the human voice is the privileged medium in practically all the world’s religions for heightening the sense of the sacred in connection with the recitation of the Holy Words. Bernat Vivancos being a pious, former choral boy from a musical and highly cultivated family, could have easily contented himself with ending his musical education once he had become an organist, a brilliant pianist and a highly qualified composer in a traditional stylistic idiom. Instead he chose to challenge this safe musical identity by submitting himself to the rigors of modernist composition at the Conservatoire National Supérieur de Musique et de Danse de Paris. The encounter with music based on sound rather than on notes – music that had neither a describable harmony nor a metrical structure – created a tension in the musical personality of this young composer, one that had to be resolved in a synthesis of a new kind. Some of the keys to this synthesis he found during a half-year stay at the Norwegian Academy of Music, as a consequence of which he was eventually able to shape his own, original style of composition. He chose to remain faithful to his spiritual, musical ideals: he continued making music that had harmony as its basis, and cultivating musical expressions of love and praise. Yet he filtered out from contemporary music elements that changed his conception of musical texture and form, and made an original synthesis of new and old. The young composer’s erudition and sociability made him a natural choice for the job as professor of composition and orchestration when the Escola superior de música de Catalunya was started a few years ago. But at the same time, his musical roots at Montserrat made their claim on him: he was called as the new conductor of the Monastery’s Boys’ Choir in 2007. Every week of the year he appears several times with his choir in the venerable church which is visited by thousands of believers, tourists and music lovers. He has also the privilege to serve as mentor and example for the boys who receive a full music education in the music conservatory of the Monastery. Bernat’s music has resisted the exclusiveness of elitist modernity while reaping the benefits from his thorough studies of it. Staying loyal to the musical impressions that first shaped his musical personality, he is now in a position to communicate with a really great number of devoted listeners, conveying to them the secrets of the angels that hover above the Holy Mount.